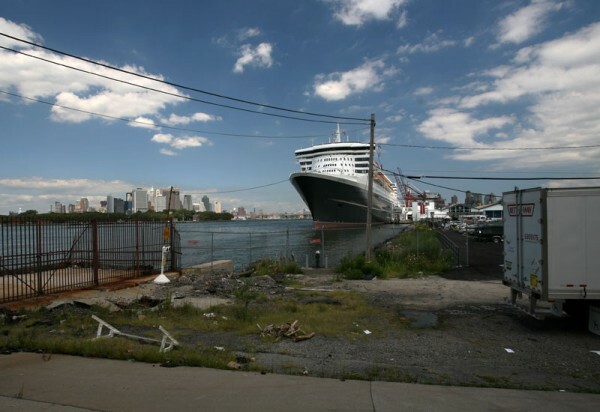 The Brooklyn Cruise Terminal in Red Hook is now the largest cruise ship facility in New York City, at least until renovations are completed on the Manhattan terminal, at West 46th Street. The Red Hook terminal is the first cruise port in the city that is long enough and deep enough for the extra-large ships. The Brooklyn terminal will accommodate 192,000 passengers from 38 ships in its first year of operation, eventually accounting for about one-fifth of the roughly one million passengers who will pass through New York City this year. IKEA is opening its store in Red Hook on 18 June 2008. A 45,000-square-foot Fairway Market opened on Van Brunt Street in 2006. The new 115-room Holiday Inn Express Brooklyn opened in 2006. See also New York Marriott at the Brooklyn Bridge. Red Hook, just across the harbor from Governors Island and the tip of Manhattan, is thoroughly urban, but in the evenings it is quiet. The neighborhood is ounded by waterfront on three sides and the Gowanus Canal on the fourth side. The neighborhood is divided into two different sections by Richards Street. To the east is “the Front,” where Brooklyn’s largest public housing project is home to 8,500 people. To the west of Richards is “the Back” or “the Point,” where you can find turn-of-the-century row and frame houses. The main commercial streets are Lorraine, Columbiaand Van Brunt. Red Hook is on the northwest Brooklyn waterfront, west of the Gowanus expressway. With a long history as a shipping port and industrial district, the Dutch gave Red Hook its name in the 17th century because of its peninsular shape and red soil. By the time of the Civil War, Red Hook was already a busy commercial district. The neighborhood boasts three public piers: Beard Street, which houses an annual art exhibition; the Red Hook Garden pier, site of the Waterfront Museum; and Louis Valentine pier, with a ramp for canoes and kayaks.